Hi and welcome to my review of fast traffic bot. Fast traffic bot was released on August 16th, 2017. It is a piece of software (or bot) that claims to automate traffic to your website, build your email list and generate income. On their sales page, they claim to use the same software to get huge amounts of traffic which in turn generates quite a bit of income. Without traffic, you have no online business, generating traffic is hard, whether that be through SEO, social media or paid advertising, they all take time, money or both and can be frustrating when these methods do not work. So generating new ways of traffic is always on my and probably every other online business owners minds. However, I am always suspect of software that claims to generate traffic on autopilot, but because fast traffic bot was relatively inexpensive I thought I might as well check it out. The creator of this bot has been in the internet marketing industry for over 20 years and has released several other digital products with great success. Eric Holmlund runs a website called ericstips.com where he provides advice for aspiring internet entrepreneurs, you can also purchase many of his products that he has sold over the years. So, what is fast traffic bot? Fast traffic bot is a piece of software that utilises safelists to generate traffic and build your email lists. What are safelists? They can be best described as closed groups of communities who have agreed to receive emails (usually email ads) from other members. You get to send a certain amount of email depending upon your membership. You can also send more emails by accruing credits, this done through a couple methods, either you view other people’s emails for a certain period of time or buy the credits. 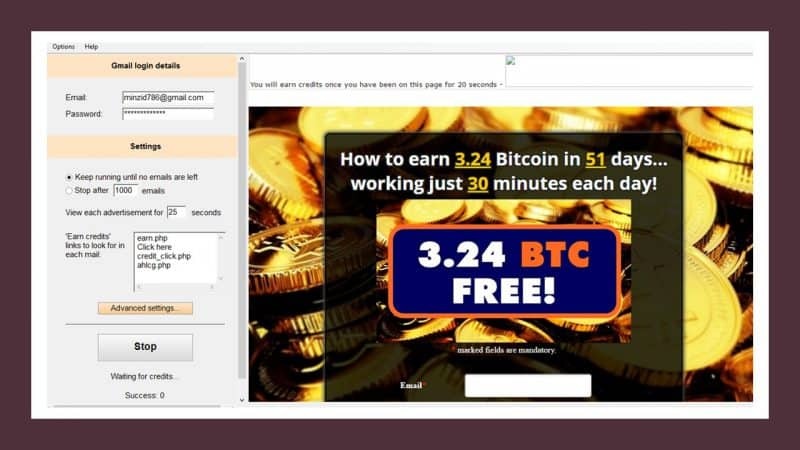 This is where fast traffic bot comes in ,it will automate the process of opening and viewing emails so that you can accrue more credits which in turn will allow you to send more emails. That is the basic gist of the software ,but the real question is does it work? Now before I go and on reveal my results after trying this software ,I will say that when I read that the traffic would be generated via safelists, I did my research on how and if safelists work. The consensus seemed to be that they are a waste of time because everyone else really doing the same thing and only trying to build their own email lists and hardly ever check the emails from other safelist members. However, some did say, it’s all a numbers game, that although hardly anyone will check the emails you send, a tiny fraction may catch your emails and that tiny fraction only becomes larger when you start sending more emails to more lists with bigger memberships. Inside the membership area of fast traffic bot there is some training on how best to use this software and one of the first things they advise is to sign up to as many safe lists as possible. They provide a list of safelists they use but also encourage you to sign up to those not on the list by doing your own research. There is a lengthy video tutorial in which Eric shows you step by step on how to install, configure and use the fast traffic bot to build your email list and send traffic to your website. You get a quick start PDF document and a 1hr 45 minute video tutorial that shows you everything you need to get started with using this software. The actual software interface is very simple to navigate and there isn’t much required on your part. All you need to do is connect one of your Gmail accounts with fast traffic bot, the training advises and I concur, that you never connect any of the safelists with your main Gmail account. This is because you will be getting thousands of emails a day (may be you already get thousands but these are mostly ads and they look spammy) and you really do not want to be filtering your way through these unnecessary emails just to get to the important ones. It is advised that you open a Gmail account just for these safelists, I would actually advise you to open two accounts for theses safelists. This is because when signing up for some of these lists, you are required to enter two email accounts, one for the emails you will receive and the other for verification purposes. They say they will never send emails to your main account but many still do and it is quite frustrating. So, if you ever get this software, and if I am being honest, I don’t think you should, make sure to open two different email accounts just for the safelists. Many of these safelists only accept Gmail accounts, although some to accept others, it is preferable if you have a Gmail account. So, as I mentioned earlier, the software has a very simply task and that is to accrue credits for you by opening and clicking on other safelists members emails. As you can see from the image below, the interface looks very simple. On your left you have your settings and login details of your email account and on the right you will see all the emails as the bot opens them up one by one and views the ads for credit. The above image shows one of the ads being viewed by the bot. There is also a tab for advanced settings, within this tab you can set the bot to determine how long it has to view an ad before your account is credited, if you want the email deleted afterward and if you want the bot to scan the spam folder as well. There is also a setting for captchas. Captchas are computer programmes that try and distinguish between human and machine interaction to protect websites against bots that try and mimic human behaviour to access other parts of a website. As with everyone one the internet, nothing is 100% secure and so captchas can be bypassed with advanced bots. Fast traffic bot lets you either ignore the captchas, manually over ride them (time consuming and really not worth it) or you can purchase captcha breakers from two different sources. In the video tutorial, it is suggested that you buy captcha breakers from one of the two recommended sources, this is because majority of these safelists feature captchas to guard against bots. Not good!!! But I wasn’t really expecting it to be after I found out where the traffic was going to be generated from. I promoted only a couple of offers, they were getting clicks, but no leads or sales. I said near the start, it’s a numbers game, the more credit you can accrue the more emails you will be able to send and maybe you get a few leads and sales. Is it worth all the hassle of going in to each safe list, checking your credit and then sending out emails in the hopes you may get a few leads? Not for me, but it may be different for others. Although my experience was not good, I wouldn’t totally write of this software, if you are patient and willing to log into multiple safelists each day and send out your emails, you may see success. However, I should also warn you that every time I wanted to use the bot, a new version of it had to be downloaded which was quite frustrating. The sales page claims that the creators of fast traffic bot use it for their online business as well. A successful marketer using a software to drive traffic from safelists? Safelists which are just full of other desperate marketers looking for leads? I don’t buy it. It could be a great tool for new internet marketers who are finding it hard to get leads and customers but despite the claims of automatic traffic, it is anything but automatic. If you are looking for new ways to generate traffic take a look at my guide on how to generate traffic from Twitter. I have also listed 24 awesome guides from around the web that will help you increase your web traffic. Have you used fast traffic bot? I would really appreciate your feedback and if your experience was different from mine. Thank you for sharing this useful post because I have a blog and I want to monetize it but traffic is very less. Keep sharing thanks for sharing with us. I would have to say no to this fast traffic bot. It just seems like to much of a hassle for me. My time is everything and I can not waste it doing something like this. I do appreciate the review as it gave very good insights in the bot. I don’t see this as a good product for anyone. You are right, it is too much hassle,unfortunately the sales page was persuasive and I thought it could bring me decent traffic. Better of creating quality content and driving traffic through search engines and social media. Great review of Fast Traffic Bot. Like all online marketers, I am looking for ways to increase traffic to my site. And like all online marketers, sometimes I am tempted to try what looks like a fast, easy way to automatically generate that traffic. It is thanks to reviewers like you that we can avoid bogus claims like those of Fast Traffic Bot. I would rather spend my time putting more quality content on my site then chasing the rare successful lead in a scam like this. Sounds like I would be doing less work with better results. Yes you are right, there are better and far more rewarding ways to get traffic than trying to take short cuts through bots. Fast traffic bot may provide traffic,but most of it will be useless and what little you get is truly not worth the hassle.